Redlands made a good start across the grades against archrivals Wynnum-Manly. 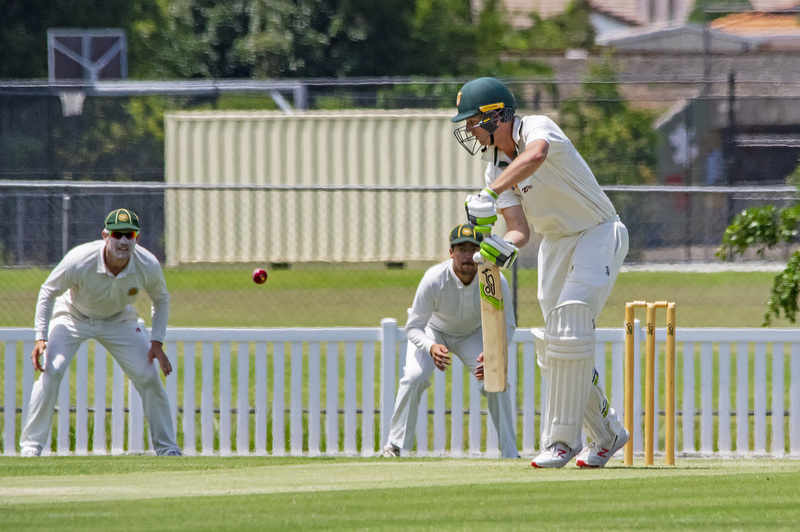 First grade returned to Peter Burge Oval for a two-day clash on Saturday and are 6/214 after the first day’s play. Liam Smith led from the front with a patient 84* and held the innings together when the Tigers lost three middle order wickets without progressing the score. Charles Mailli also chipped in with an unbeaten half century before storms put an end to play in the 79th over. Second grade bowled first against Wynnum-Manly and will return next weekend full of optimism following a first-class performance. Jamie Ryan set the tone with two wickets in a 22 over opening spell that saw the opposition slump to 5/50. The Tigers dominated the first session, but a middle order partnership saw Wynnum-Manly salvage their innings to finish the day eight down for 201. Craig Weier and Lenny Watt claimed three wickets apiece in one of second grade’s finest bowling displays of the season thus far. Third grade find themselves in a war of attrition away from home. Wynnum-Manly are 4/190 at stumps with Luke Haegel (2/46) and Pearce Anderson (2/42) the men to do the damage so far for Redlands. Fourth grade continued their good run with the ball on Fred Kratzmann Oval, claiming seven opposition wickets for 130 during the 51 overs of play so far. Alex Ward (3/24) and Lincoln Rosiak (2/16) were the pick of the Tigers bowlers alongside Ravin Wijeyeratne, who passed the outside edge with ease throughout the morning session. Fifth grade had a day out away against the University of Queensland, and will require 200 to claim first innings points next weekend. James Vidal (7/51) and Dylan Grey (2/29) exploited the spin friendly conditions to run through the University batting order and give the Tigers batsmen a below par total to chase next Saturday. Sixth grade one made a considered start to their clash with Wynnum-Manly, scoring 4/189 on the first day’s play. Ryan Short top scored with 76 while Will Read and Greg Morton also chimed in with 36* and 35 respectively. Sixth grade two capped off a fine weekend of bowling for Redlands, with the Sandgate-Redcliffe batsmen managing just 129 runs for the loss of seven wickets on the first day. Skipper Matt Wheeler and Ben Thompson shared in all seven opposition dismissals and returned figures of 4/29 and 3/31 respectively. The Redlands Tigers Lord’s Taverners side lost a tight affair to Sunshine Coast on Peter Burge Oval. The Tigers bowlers maintained tight lines throughout the innings to restrict the visitors to 180, with young quick Josh Smith claiming 6/24 from ten overs. Despite some impressive individual batting performances, the Tigers were unable to stay above the required run rate, falling 12 runs short of victory in the final over. Sam Geyer was the stand out with the bat, scoring 59. Jack Sinfield (28) and Keegan McClean (25) also chipped in with important cameos. The Redlands Tigers Jodie Fields Shield side won back-to-back games on Sunday when they overcame Ipswich Logan on Fred Kratzmann Oval. The ladies dismissed the visitors for just 97 in another outstanding bowling display which saw Clodagh Ryall (4/13) and Hannah McLaughlin (3/22) continue their good form. Jess Sanders (2/6) also returned impressive figures to help Redlands restrict the opposition. Denise Sanders (22) and Delyse Laycock (33) saw their side through to a comfortable win that will see them further improve their impressive ladder position.